Home News Ooni felicitates with Buhari at 76, calls him a paragon of servant leadership. Ooni felicitates with Buhari at 76, calls him a paragon of servant leadership. Arole Oodua & Ooni of Ife, Ooni Adeyeye Enitan Ogunwusi, Ojaja II has congratulated President Muhamadu Buhari on his 76th birthday anniversary. Expressing his congratulations to the President on Monday Iin a press statement signed by dis Director Of Media & Public Affairs, Comrade Moses Olafare, Ooni Ogunwusi described the President as a paragon of servant leadership whose legacy will be too legendary to be forgotten by the present and future generations. "Mr President, I feel proudly delighted to felicitate with you, your family and Nigerians at home and in the diaspora. You are indeed a paragon of selfless servant leadership whose sterling contributions have undoubtedly added values to our young democracy. 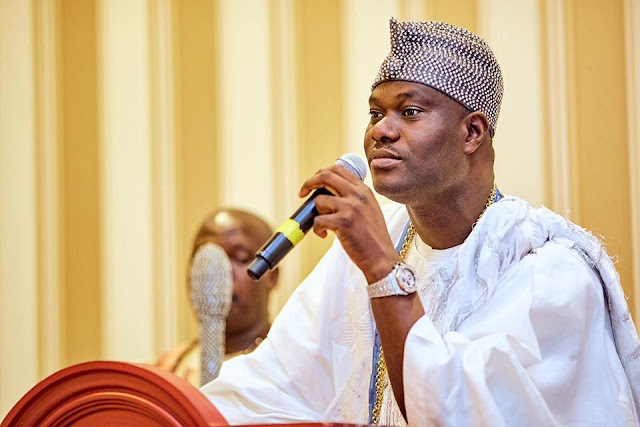 "Your impacted inspirations will remain indelible in the minds of the present and future generations and Nigerians will forever appreciate your legendary legacy as a great leader who has served creditably well,".Ooni Ogunwusi Said. Co-chairman of the National Council Of Traditional Rulers of Nigeria urged Nigerians to always support President Buhari with prayers to fully succeed in taking the country to greater heights. "We should always support him with prayers so that his leadership which has always meant well for this country will ultimately succeed.